You can use this simple and at the same time powerful investment calculator to see the magic of compounding, as Albert Einstein once said, it’s the 8th miracle of the world. Why is it called this way? If you want to enrich a bit your knowledge on the matter, you can check our cool topic about what compound interest is and how exactly it works. Then come back here to see it in action. Optional, amount you add to your investment ever year. For how many years do you invest? Using this calculator you can calculate the return on your investment over a specified period of time, at a certain interest rate. Imagine that you are currently 22 and you want to retire when you are 52. You need at least a million dollars for this. But all you have now are $10 000 and you decide to invest the money in a hedge fund giving you 12.5% interest yearly (on average). It’s a bit high, but you can find such a return. The major stock market index (Dow Jones) returned around 11.8% for the last four decades. The Dogs of the Dow investment strategy brought even over 17% annually for the last 45 years. So, you plan to save and add to your investment $2500 every year, in order to retire as early as possible (preferably before you die of course). So, you have ten grand and 28 years. You plan to reinvest all of the profits from your investment. What do you think you will have saved when you get 52? If you put all of this data into the investment calculator, it will show that when you get 52, you will have the astonishing amount of $1,007,299.15, just enough for retirement. And you will not only retire but also you will be a millionaire. A simpler task to solve would be a calculation that can show you what you will earn is you choose a bank account for your savings, instead of the fund from above. If deposit yields are around 4%, you start with 10 000 and invest 2500 yearly, after the same 30 years your investment will grow to only $ 172,646.32. This is a big difference, isn’t it? This is why this calculator can be so helpful. How to use the investment calculator? Initial Investment – this is your investment you start with. Annual Addition – you may (or may not) add money to your investment on a regular basis (every year). Interest Rate / ROI in % – the compounding rate/interest rate of your investment, just type a number. 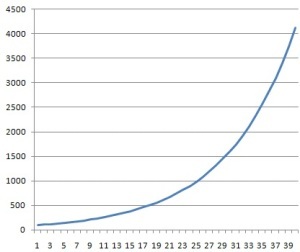 Number of Years – The time you invest for (in years). Reinvested Profit (%) – the percent of the profits from your investment you reinvest back. This should be 100 if you don’t plan to withdraw money during the investment. If you wish to withdraw 50% of the profits, just type 50 there. If you have a question about this investment calculator, or you think it doesn’t work properly, please, get in touch with us. If you want to place the script on your site or blog, you can do that, too. Please, consider sharing this tool with friends, if you like it. Thanks!